Net Worth Update (September 2017) — Future Proof M.D. 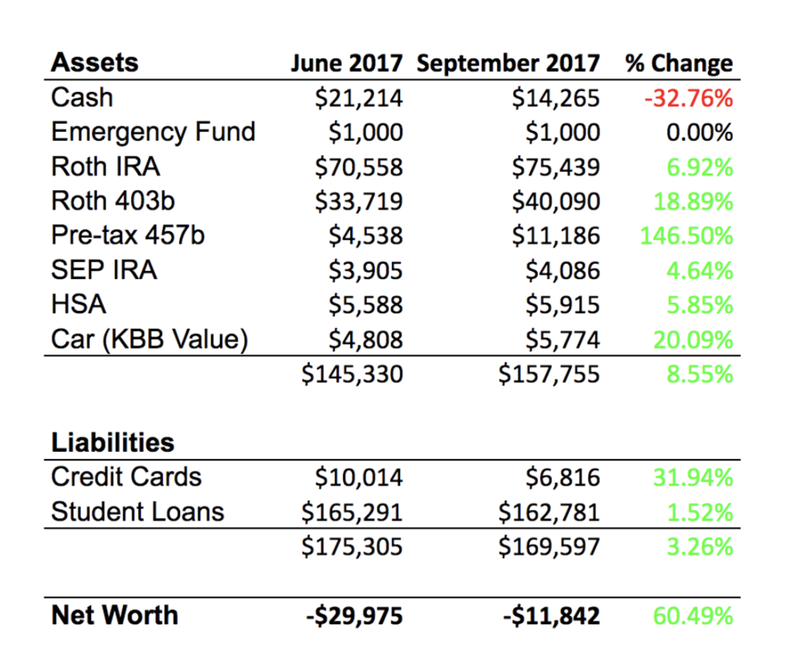 Welcome to the September 2017 edition of the FPMD Net Worth Update - a quarterly post where I put my money where my mouth is and tell you all about how I manage my finances. Over time, it has become the most popular series on FPMD. I talk the talk, but do I walk the walk? You be the judge. Here is what I've been up to for the last 3 months. Cash - I've been actively trying to decrease the amount of cash I hold. I've made some progress but still have a ways to go. Emergency Fund - I maintain a $1,000 emergency fund and luckily, I haven't needed to use it so far. Roth IRA - The gods of Wall Street continues to smile on America, there has been a continued upward trend in market value of my investments. Roth 403(b) - Steady growth here as well. Unfortunately the rumors that my employer would start matching resident contributions turned out to be incorrect. Pre-tax 457(b) - Dramatic uptick in value over the last 3 months primarily due to contributions. I have my contribution set to max out $18,000 for 2017. As to why I started a 457(b) plan, check out this post. SEP IRA - I have not made any contributions to my SEP IRA since the last update since I do not know exactly how much business income I will generate this year. But I plan to contribute the max allowable. As to why I started an SEP IRA, check out this post. Health Savings Account (HSA) - I'm scheduled to max out the annual contribution limit of $3,400 from paycheck deductions. While it's not a large amount, it's still a nice bonus since that money is entirely tax-invisible. If you are curious why I switched from a traditional medical plan to an HSA, see my previous posts here and here for the benefits of an HSA. Car - I have no idea why the KBB value of my car went up. But I'm perfectly ok with that development. Credit Cards - I took some small steps to curb my credit card spending habits but I still use credit nearly exclusively for purchases. My favorite credit card is still the Chase Sapphire Reserve. For a list of my most used credit cards, see Future Proof Toolkit - My Favorite Credit Cards. Student Loans - I'm currently making income-based payments on the REPAYE plan. See why I Switched to REPAYE and I Like It. My overall goal remains unchanged with the intention of qualifying for Public Service Loan Forgiveness (PSLF) in 2024. There was a 60.5% increase in my net worth over the last 3 months! Yep that took me by surprise. After checking and rechecking my numbers, it really boiled down to one major factor - I can claim more moonlighting hours now as a senior resident. Net worth ZERO is within reach!